Consider a car. We select it on a whole range of criteria and recently gas mileage has become an increasingly important factor. We still want big cars, but we still want it to be energy efficient and get good mileage. The index used for cars is MPG. Think of the HERS rating index as the MPG number for your house. The only difference is that the HERS scale uses 0 as a value where no outside energy is consumed (house produces as much energy as it consumes) through solar panels, geo-thermal heating, wind turbines, etc... so a lower score is better where for cars a higher score is better. The HERS scale goes from 500 down to 0 where each number represents a 1% difference. The average new house built to minimum code in the USA scores about 100 on the HERS scale and you reach Energy Star levels at 75 to 70 depending on which Energy Star version (2.5 or 3.0). Our house scores a pretty impressive 38 on that scale. A quick browse around the web learns that there are precious few houses under 38, espcially not without the use of any renewable resouces. 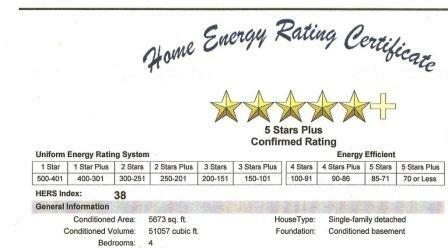 The 38 score means that our house is a whopping 62% more efficient than the average new American home that is build to minimum code.This translates in a pretty low monthly utility bills. The score of 38 based on the overall scall... as you can see anything below 70 is basically 'off-the-charts'. That brings me back to my opening line...'why this number might actually start to mean something for the average American home buyer and home owner within the next couple of years'... There are some talks in the industry to add a HERS index to how mortgages and home appraisals are being calculated. A house with a low HERS index will be worth more since it's using less energy thus leading to lower monthly bills. That in-turn can be used in mortgage applications since disposable income in a lower HERS index house is higher than in a house with higerh HERS index.